Charitable trust - financial assistance for artists, nurses and women in need. The Eaton Fund has been a charitable trust since 1954, providing financial assistance for artists, nurses and women in need. Originally, the Trustees were all Eaton family members, and the Fund was first chaired by Mr. Charles Eaton Mills, JP. Our current Chairman is Dr Stephen Kane who is assisted by five other Trustees, pictured below. 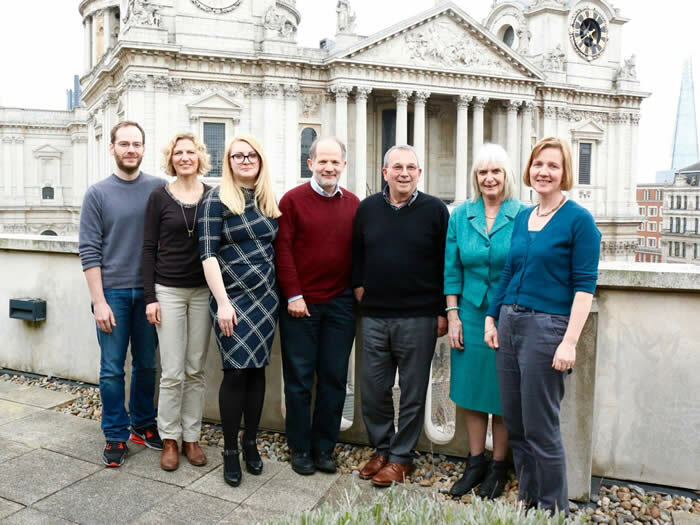 From left: Stuart Woltkamp-Moon, Jessica Ecott, Flavia Richardson, Dr David Wilson, Dr Stephen Kane, Nicola Brooker, and Anne Murray (Manager). Nicola Brooker and Dr David Wilson are members of the Eaton family and carry on the tradition of family involvement in the Eaton Fund's work. As a charitable organisation, we welcome sponsorship in order to continue our work. Efficiency, transparency and effectiveness make up the template for good use of charitable funds and we believe the Eaton Fund is performing well in these areas. Please take some time to view the details of our website. You are welcome to contact us for further information.